Every good pup deserves a treat now and then! 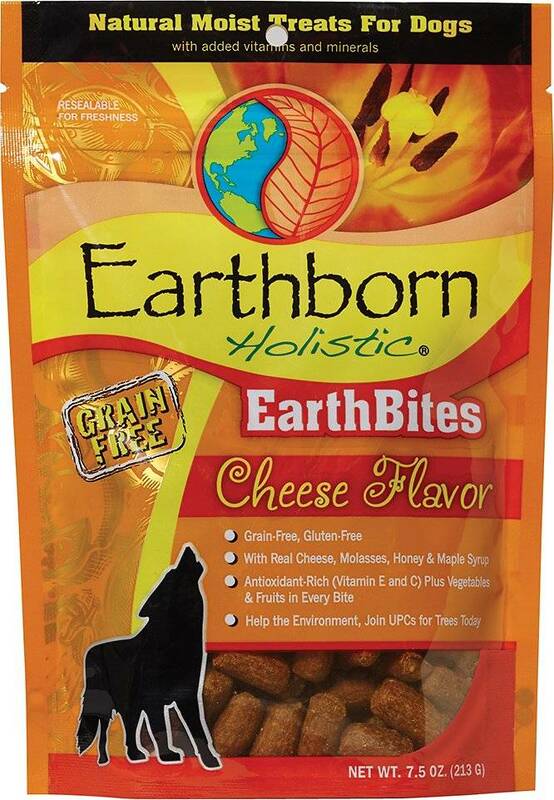 When looking to reward your dog, provide the same healthy benefit of Earthborn Holistic's nutrient-packed dog and cat foods in a bite-size treat with Earth Bites! These moist snacks are a treat for the taste buds—packed with all the proper nutrition to help energize your dog for their active lifestyle. Made with high-quality proteins and wholesome fruits and vegetables, each treat gives your pup good taste and good nutrients! They are also grain- and gluten-free to provide the purest benefit to your pet. Earthborn Holistic's oven-baked, grain-free dog treats are made with MSC-certified Antarctic krill meal, a rich source of Omega-3 fatty acids, protein, and other nutrients. Omega-3s sourced from Antarctic krill meal support immune defense, brain and cognitive health, as well as skin and coat health. They are efficiently absorbed and delivered to where your dog's body needs it most. One-hundred percent sustainable and 100-percent traceable, the krill meal is sourced from some of the cleanest waters on earth. Combine that with nutrient-packed fruits and vegetables and protein meal into a delicious oven-baked biscuit, and you end up with one healthy and delicious training aid for your pet. Earthborn Holistic Earth Bites come in a variety of flavors and formulas, so stop by The Pet Beastro to reward your pup with a FREE sample this Saturday from 12 - 3 p.m. We'll be featuring Earthborn Holistic pet foods and treats, so we hope to see you then!